Get your paddle ready for a good cause. Early bird tickets on sale now for our Annual Charity Gala. The next item up for bid could be yours. Get your early bird ticket rate now for our Annual Charity Gala. The early bird gets the worm. But when you purchase your ticket now to our Annual Charity Gala, you'll get a special early bird discount! Last year's Charity Auction was amazing! Wonderful crowd supporting our mission to get Combat Vets outdoors! We are once again hosting the event at LeMay - America's Car Museum April 20th, 2019 at 6pm! Watch your FB for your opportunity to get tickets and prepare for an enchanted evening! You're invited for an evening of celebrating the sheer, massive power of hope. You'll meet some amazing combat veterans, and hear their courageous stories. Join us for dinner, our silent auction, and live music. All proceeds will benefit Mission Outdoors. 6,500 former military personnel killed themselves in 2012. More Veterans succumbed to suicide than were killed in Iraq. In 2012, 177 active-duty soldiers committed suicide, conversely 176 soldiers were killed in combat. 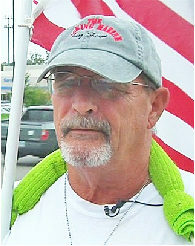 Come meet Terry Sharpe “The Walking Marine” who is raising awareness of the current Veteran suicide rate, which stands at 22 per day — the equivalent of one Veteran committing suicide every 65 minutes, by walking 300 miles every year. Special pricing on presale tickets available for a limited time beginning February 14th. Follow us on Facebook and subscribe to out newsletter for early access to all the latest details.